When replacing your roof you are looking at a long term project you do not expect doing again in the next few years. Whether you are doing the project yourself or you are having it contracted out, they type and warranty of the shingles are something you should know. 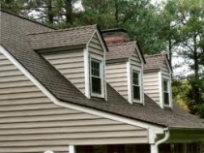 GAF Roof Shingles have a great warranty plan and come in a large variety of styles and designs. Most Contractors will give you the name and type of shingles when they give you an estimate on the job. If that information is not included be sure to get it. Do not use second rate shingles and have to redo the job in a few years. GAF Roof Shingles has been around for years and is a multi billion dollar company that started in 1886. They specialize in all types of roofing shingles for any type of job and look. There are 15 different types of shingles and varying colors of each Style. They also have a wide range of prices and quality to fit any budget. Most people use the three tab asphalt shingles, which they make in a wide array of colors. If you are looking for something unique and different GAF Roof Shingles make a laminated shingles that looks like tile, clay or wood shake. These shingles look really great on a step roof and have a shadowed affect that gives the appearance of real clay or tile roof. Some of these like the timberline shingles come with a lifetime warranty. Since the company has been in business so long you can be assured that they will be around to back up that warranty. GAF Roof Shingles can be found at any of the home improvement stores nationwide. They are backed by a great warranty, and come in any style you are looking for, and maybe even a few you had not realized existed. As we all know that the roof is something we do not want to do very often and can be an expensive project, take the time to check out the products that are available. Do your roof with good quality materials and rest assured that you will not be doing it again soon.